What makes a brilliant reporter with so much experience commit career suicide ? Today's post is about answering that question. After fifty years as a presidential correspondent, Helen Thomas resigns over allegedly offensive remarks about Israel, and the world is a happy place again. In short, when asked if she had a comment about Israel, Helen Thomas said "Tell them to get the hell out of Palestine, remember these people are occupied, and it's their land." When asked where the Israelis should go, Thomas added: "They should go home, to Poland, Germany, and America and everywhere else". Naturally, Thomas's comments caused outrage, many officials called for her resignation, which kind of begs the question: What makes a brilliant reporter with so much experience commit career suicide ? Today's post is about answering that question. "Why did the jews move to Palestine ?" For me to answer that question, I'm going to have to take you back about a hundred years into the past. The year is 1916, this is World War I, and the region known today as the Middle East is part of the Ottoman Empire. 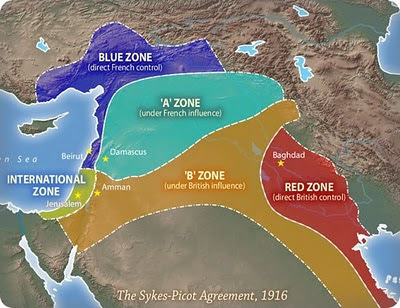 As the Empire lost ground in the war, the region suddenly was up for grabs, and so it was only a matter of time before the French and the English figured out a way to divide it up: And that's how the Sykes-Picot agreement saw light of day. 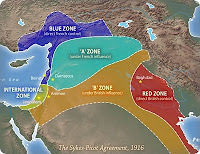 In brief, the area was to be divided between the French and the English, with what is known today as Jordan and Iraq falling under English control or influence, while Lebanon, Syria and parts of Turkey fell under French control or influence (map here). That left out a small portion of the middle east, Palestine, as a zone with special status. At this stage it is important to note that the year is 1917, which means that at this stage, had the holocaust never happened, Israel would still have been created. It is also worth noting that in 1917, there were jews in the Middle East, as part of the diverse religious makeup of the Arab population. In other words, the jews that were in the Middle East in 1917, were mostly Arabs. The reason I say mostly, is simply because the Zionist movement had begun encouraging jews to "return to the land of Zion", in other words Palestine, since 1881, which means that the jewish community in Palestine had already been artificially inflated by the time the British got their hands on Palestine. During the British mandate over Palestine, the jewish community grew from one sixth to nearly a third of the population, through a constant flow of jewish immigrants, and therefore while the holocaust seems to have accelerated things, it certainly was not the cause of the gathering of so many non-Arab jews in Palestine. This was all part of a Zionist plan that started long ago, and got legitimized in 1917 through the Balfour Declaration. What happened afterwards, was mostly politics, and the British trying to get away with their conflicting promises. I believe that answered my second question. Now as to why would Helen Thomas, an eighty-nine year old presidential correspondent with fifty years in the white house decided to commit career suicide, by insinuating that Israelis do not belong in Palestine and that they should go home to wherever they came from, I believe the answer is simple. While modern day politics and media seem to have made the conflict over Palestine look complicated, the roots of it are quite simple: It's Palestinian land, and they are currently occupied. Sure there are UN resolutions about where the borders should be between Israel and Palestine, but when you get down to it, Israel is the physical manifestation of an invasion, and no matter where you put the borders, Palestine is still occupied. Helen Thomas's comment simply voices a message that is about sixty years old, and that Palestinians did not know how to express when the time was right: Jews of Israel, Return To Sender. For more on why Americans cannot possibly understand Thomas's comments, read this.